The Monster Memories tradition at Scary Monsters magazine continues in this epic tribute to dragons, dinosaurs, daring do-gooders, and damsels in distress, with a focus on Ray Harryhausen films. Reminder, this particular issue is not available at Barnes & Noble bookstores (all future issues will be). But, it is available at some Books-A-Million outlets and comic shops that order through Diamond Comic Distributors. Of course you can order it here or ask your local comic shop to stock it! Scary Monsters carries on the 27-year tradition of issuing an annual of all new, all scary material! 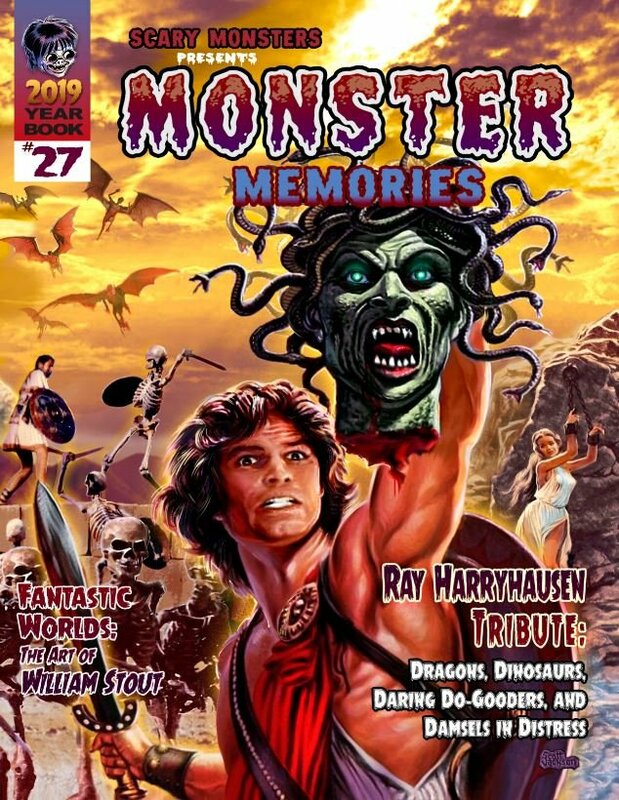 Monster Memories #27 for 2019 is perfect-bound and will be jam-packed with 144 pages of nostalgic reflections of the classic films, monsters, creatures, actors, directors and stories that influenced us as kids and still do today. We pay special tribute to many Ray Harryhausen films featuring stop-motion Dynamation, including The 7th Voyage of Sinbad, Jason and the Argonauts, Clash of the Titans, The Valley of Gwangi, and more! Now, enjoy Dr. Gangrene's video preview of Monster Memories #27!